Did you know that a lot of people have a sock monkey fetish? Yep, they do. I really like sock monkeys, but my fetish would be more of penguins & polar bears personally. 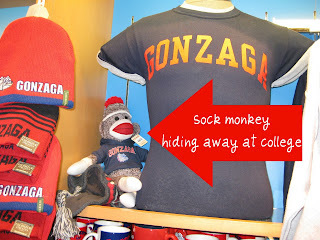 I did, however, really want to make sock monkeys for Christmas. I made some for Independence Day and I felt a strong desire to make them for Christmas too. I just love my Sock Monkey cookie cutter from eCrandal.com so I want to use it every chance I get! I still haven't invested in the full body sock monkey, but I'm hoping to one of these days as it is so cute and would be fun to make with these face sock monkeys. SugarBelle made a wonderful tutorial on how to make sock monkeys, so my little heart jumped and I just had to play along! As you can see, I also tried both a solid hat cuff and a ruffled hat cuff. I also gave my sock monkeys ears. When hubby and I were on vacation in Palm Beach with his company earlier this year, I saw this ADORABLE sock monkeys in a store window. Today I'm working on winter wonderland cookies and I'm SOOO excited about them. Hopefully they'll be ready to share pictures tomorrow. In the meantime, enjoy the Christmas sock monkeys!